A rebuilt dry stone retaining wall. The original wall had failed partly because it was minimally built and partly because additional soil had been piled above it, creating a much greater load than the wall was originally intended to support. 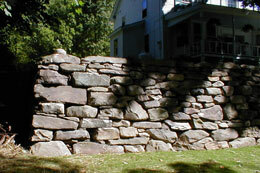 The original stone wqas used supplemented with stone collected from other parts of the property. The wall is approximately eighty feet long and five feet high.